The perfect sweat patterns are elusive and evolving. 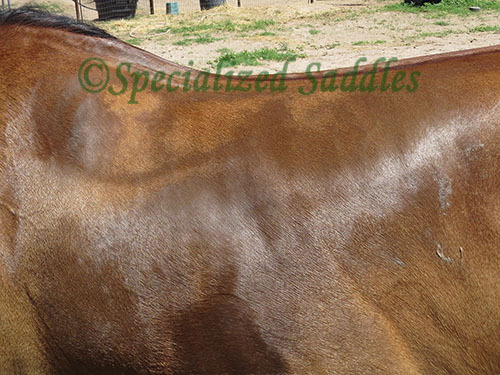 We all like to see perfect saddle bar outlines on our horse when pulling off our saddles but sweat patterns are affected by many factors. 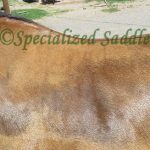 Temperature and humidity affect evaporation of sweat, ventilation of your saddle influenced by pad material and thickness, and the condition of your horse’s coat all impact sweat patterns. 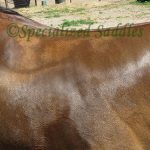 Temperature changes from summer to winter when your horse has longer hair vs shorter hair will alter they way sweat patterns look. They are also impacted by the amount of work your horse is doing and how long you have ridden. 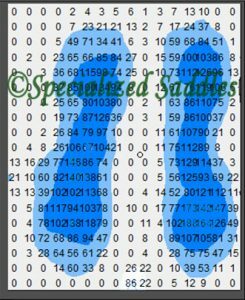 What you do in last 20 minutes before you take your saddle off with your horse will influence your patterns. Sweat patterns can also be influenced by previous permanent damage to sebaceous glands caused by long rides in a bad fitting saddle. If the glands have been damaged they may never sweat again making the pattern always dry in certain areas. If your riding discipline includes sudden slow downs for turns and stops, this will cause forward pressure on your horse’s shoulders due to the momentum resulting from rapid changes of speed. The high pressure associated with high speed stops causes increased heat , affects evaporation, and thus sweat patterns. How you sit in your saddle; leaning forward, balanced and centered or slightly backwards will affect weight distribution, pressure, and evaporation and resulting sweat patterns. Photo A and Photo B are pictures of sweat patterns from the same horse on the same day with no fitting cushion or shim adjustment. Photo A was taken after a 5 minute warm up. Photo B was taken after a vigorous 10 minute workout. Photo C is of a pressure pad reading that shows pounds per square inch a saddle puts on a horses back. The saddle was pressure padded on this horse immediately after the photo B was taken. Photo C verifies the saddle fit and had no pressure over 2 psi and that it had an even distribution of weight and perfect adjustment. Note: The dry spots on Photo B after the vigorous workout are due to the prior use of a narrow non Specialized Saddle and thick wool pad causing bridging and “hot spots “. 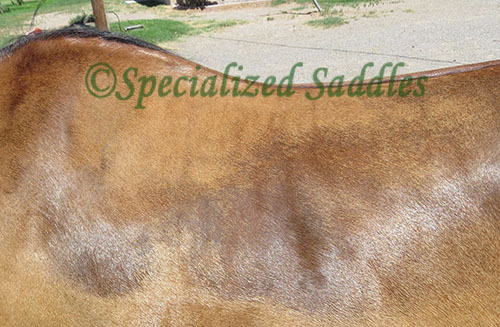 These spots do not sweat even with perfect saddle fit due to this tissue damage. Understanding exactly what is causing the sweat patterns you see is difficult; therefore, sweat patterns are really not a reliable indicator of saddle fit. Most importantly observe your horse’s attitude and behavior when you are riding. Indications of bad saddle fit are tripping, pinning ears, head tossing, bucking and refusal to move forward. Check the fit of your fitting cushions directly on your horse without your saddle pad periodically. Ensure that you have even distribution of weight along the entire bars of the saddle for the best fit by checking that the fitting cushions do not have any gaps between them and your horse. I bought a Euro Lite for my horse/pony, a hard to fit Paso Fino, and me, a 70+ year old rider. Saddle fit was my first priority and your system allows me to perfect the fit for him. I love being able to tweak the fit depending on his condition at the time.I have always ridden English but felt that I needed a little more security than my English saddle provided. Western saddles just DO NOT fit my Paso nor do the treeless or the saddles supposedly built for Paso Finos. The Euro Lite is FANTASTIC. It fits my little horse and is super comfortable and secure for me. I have never had such a comfortable saddle. I wish I had bought one years ago. I had ridden as a young person and have just started riding again in the last seven years. I am primarily a trail rider and one of the things I have noticed since getting my new saddles is that after riding for several hours I have no pain in my back, hips or knees (a condition that effects a lot of older people and causes them to cease riding) which was not the case before in a different saddle. In fact, if I have a problem with any of those body parts, a ride in my saddle will eliminate them for days so I am riding much more. Riding instead of pain meds, what a concept. The other thing is that my horse is much freer in his movements. He has always gaited but now he flows and is far more relaxed. I watched your video and thought “WOW” when you were riding girthless and thought it was probably a trick. It wasn’t! I girthed my horse one day and forgot to check after I had been riding for a while. Had a great ride. Got off and started to untack him and found the girth was totally loose. The saddle had not moved an iota during my mounting, riding and dismounting. I was impressed and have never forgotten to check since then. I also love the pad an girth I got with the saddle. They are well worth the extra investments. Thank you for making such an awesome saddle that is not just for the endurance rider but is fantastic for any rider old or young who would like to enjoy trail riding in comfort for their horse and themselves. I am so glad to have come across Specialized Saddles. I have managed to have two hard-to-fit Arabs and you have taken the time to custom fit them with your fine saddle. Plus it doesn’t hurt that the saddle looks so sharp! Did I tell you that I tried 3 different saddles before the Specialized Saddle to find one that would fit Nadara? Thanks for always helping me out. I sure love my saddle! I sure love my saddle! Without such a light saddle I would have given up riding because of my back. Thanks for a wonderfully comfortable, lightweight design that feels great to my horses and me!